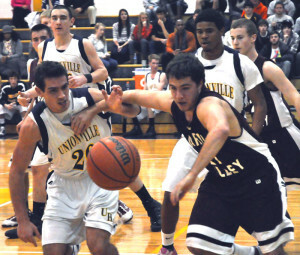 Unionville's Mike Sundry fights for a loose ball against Garnet Valley, Friday night. The Indians dropped a tough, 43-41 loss to the Jaguars. EAST MARLBOROUGH — It wasn’t the start — at least in terms of the final score — that head coach Anthony DiNicola hoped for in his debut with Unionville. But despite a nail biter of a loss to Garnet Valley, Friday night — there were a lot of hopeful signs for what has been a struggling Indians program. In dropping 43-41 decision to the Jaguars in the opener of Unionville Tip Off Classic, Unionville (0-1) showed, at times, a tenacious defense that led to a number of two-on-one breaks and at other times looked like what they are: a relatively inexperienced team learning a new system. Still despite all that, the game was tied 38-38 with 2:23 after Mike Sundry hit a three from the corner that tied the game and send the crowd into a frenzy after being quiet most of the night. 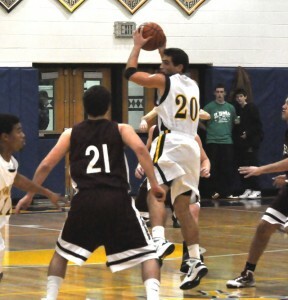 But Ryan Kelly came back a jumper and then Jules Raucci hit the front end of a pair of foul shots to make it 41-38. Noah Scott’s bucket with :10 appeared to seal the deal — but then Matt Christopher hit another three with :03 left to bring the Indians within two, but they couldn’t force another turnover in the final sequence. That final sequence was a lot like the game, a lot of possibility, but Unionville seemed to struggle in getting details down, looking sluggish at times on offense. 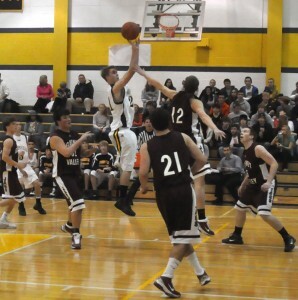 Mike Sundry goes up to grab a pass against Garnet Valley, Friday night. Another problem: forcing turnovers, getting odd-man breaks but then being unable to turn it into points. Case in point: in the second half, despite pushing Garnet Valley into serious foul trouble, Unionville went just 3-of-8 from the line — in the same stretch the Jags were 8-of-14. But it wasn’t all doom and gloom: the Indians were downright fierce at times on defense and showed real intensity. Not surprisingly, in a matchup of teams that combined for a total of six wins during the 2009-10 season, play got ragged at times and both teams seemed to struggle getting into anything like an offensive flow. Not surprisingly, as one of the most experienced players on the team, Christopher led the Indians with 13 points, while Sundry added 12 and Ross McManus had nine. 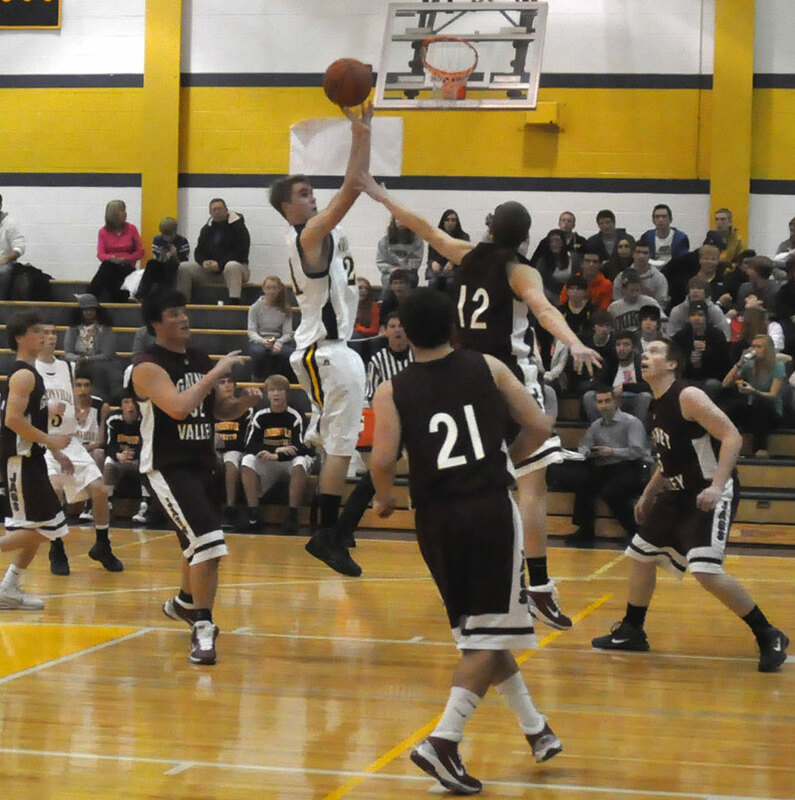 Matt Christopher takes a jumper for Unionville against Garnet Valley, Friday night. McManus, a junior, maybe best typified the overall night for Unionville. At times, he looked like a world-beater at other times, he seemed to be rushing, trying to do too much. He called for traveling a couple of times — and seemed close to drawing a couple of additional calls. But when he was able to relax and just play, he showed a lot of potential.